I just wanted to let you know that I love your math puzzles. They are so addicting! I am always so impressed with what you write. I loved this weeks story (Negative Numbers and Positive Attitude). You inspire me to try to be a better math mom, because I am one of those with a poor math self esteem - that you write for. One day you need to tell me how math led you to meet Harrison Ford. What a hoot! I love it. I thought I was the only crazy one telling/teaching my 11 year old grandson about logarithms and converting my son's alarm code to binary. Great job and a fun way to start my day. What a great idea! I am forwarding it to the teachers in my building - not only the math teachers. I looked at many of the sections and it takes an imagination to come up with all of them. Brilliant, Maria - This is well-titled, very funny, and understandable to the mathematical plebian. 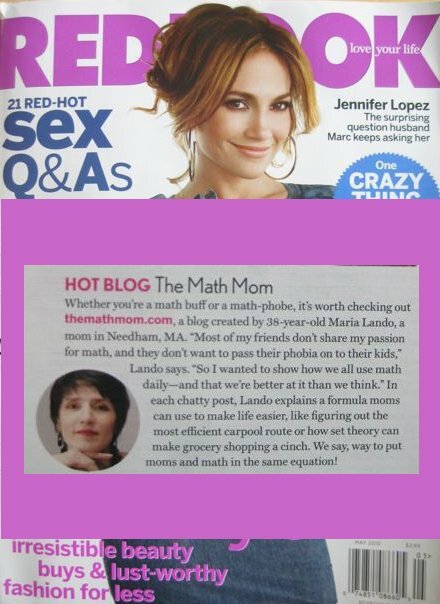 Dear Math Mom, I love you. I wish you would have been around when I was much younger and you could have helped me with math. I got an MBA but I really had to work at it. Now reading your blogs makes me a little less scared of math and a little more interested. My youngest child is too old now to get the benefits you could provide. She is terrible at math but did start the University at age 16 and is a top student all in what she is good doing..liberal arts. Wants to be a lawyer. I guess they hire math people as needed. It's always so fun to read your stories - I never know how you will shift my perspective on a seemingly routine aspect of family life. This is wonderful! And of course I went and read some more of the blog, and I love it. This pieces are great, funny, and so smart. thanks for sharing this! Math mom, you are my hero. I don't know how you have time to be a mom, and do all the research required to run this blog. Maybe you should do a puzzle on time management, because you obviously have that figured out!! :) Thanks for enriching my math life! I have always been a non-math/science person even though I was a very good student. I had an amazing Calculus teacher in high school who came to class with a guitar and lots of props to make math FUN. He was hilarious. He spoke of the poetry of higher mathematics and also its practical applications in everyday life (much like how you write on your blog). It made a lot of sense to me and that's how I grew to enjoy Calculus. As soon as this teacher left, he was replaced by a very weird-looking tall Englishman with no chin and terrible coffee-breath. He had a unibrow. He wore thick milk bottle glasses. He barely made eye contact. He was terrible. I started disliking math because he made it all about JUST numbers with no applicability. Trigonometry was hell for me. INcredibly boring. I vowed to just get through it so I scored high on my AP exam, and never take another math class (in college) again. And that"s what happened. No math for me after my senior year in high school. I have always disliked how being smart was associated with being good at math/science. It didn't make any sense to me. I didn't think that my trigonometry teacher was smart at all. He had no emotional intelligence. He was stunted in social skills and could barely relate to his students. I believe there is a more balanced way to be smart in the real world and you are a prime example. You use your math skills to quantify then illuminate problems/solutions in the real world. One needs emotional intelligence to be able to do this. Without emotional intelligence, you can not see/understand issues that consume people on a very basic, humanistic level. And yes, there are enormous problems out there in the world that probably don't require emotional intelligence, just a quick-thinking scientist....but in terms of the everyday issues, yes, one needs emotional intelligence to be able to solve problems. Anyways, what I think YOU have that is different from others is the combination of math smarts and emotional intelligence. You show that math can be fun and loving. This is very rare. You are a parent, filled with love and concern--your problems showcase issues that most parents deal with everyday. Parents are always looking for enlightenment. Help. Clarity. And I think you do it! 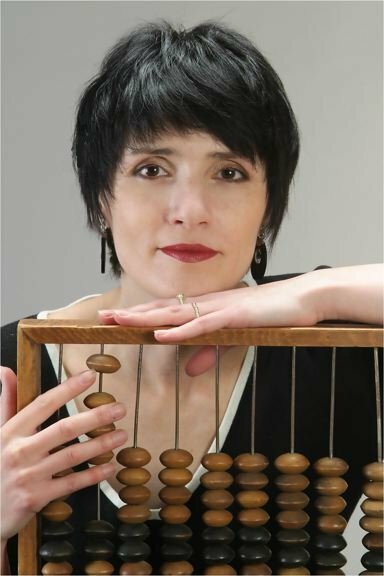 I just read the article about you in Boston.com and was thrilled to hear of another mom wanting to demystify math (not only for her children but for her friends as well!). I LOVE your blog and just signed up to get emails. I am a stay at home mom and periodically search on the internet at night to look for brain teaser puzzles (anything to keep my mind going!). I used to work in finance at a large health insurance company before choosing to stay at home with my two boys. I believe so many problems can be solved by just looking at them in a logical way and have now convinced by husband that it can be done! I grew up loving math and science but never found the support that I needed as a kid and a student. In fact, as a college student, I once stayed behind after class to ask my math professor some questions. After asking her some questions, she (yes, the professor was a female and head of the math department at the time-circa 1989) looked at me and in a very patronizing tone of voice said, "Why does a pretty blonde thing like you try so hard? Why don't you just stay home and marry a doctor". I was pre-med at the time. Because of that incident and others, I have always been determined to encourage my kids to have fun with math. Thanks for listening and I wish you tremendous success with your endeavor! Join these readers and follow TheMathMom's stories, puzzles and ideas by subscribing to a weekly newsletter.